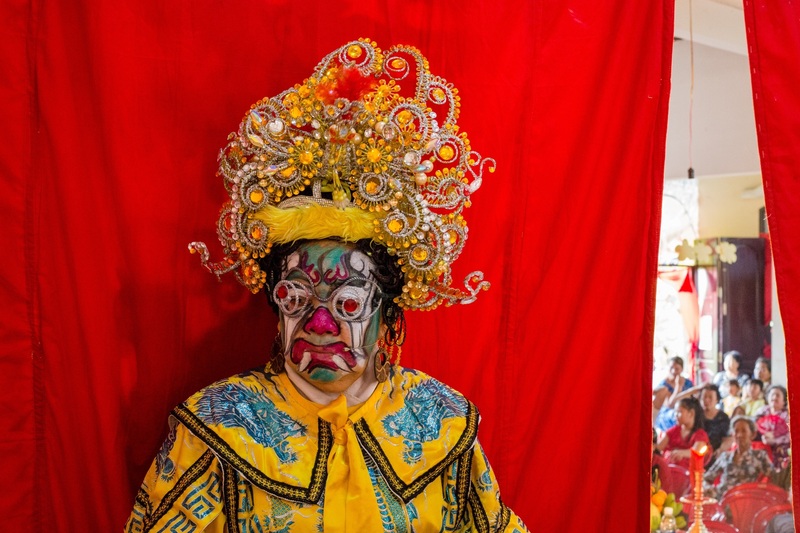 Hat boi, a Vietnamese operatic art form, is kept alive by poor artists afraid it will die with them. 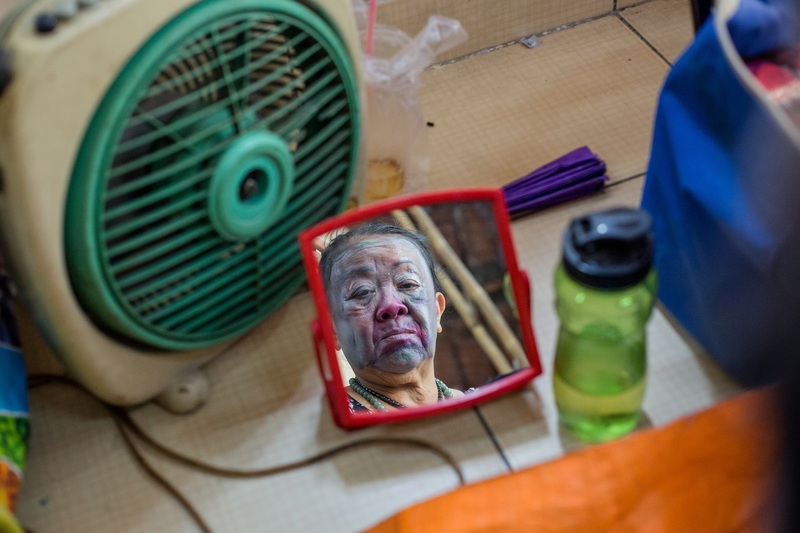 Nguyen Thi Hanh lives in a small rented apartment in My Tho, capital of the Mekong Delta province of Tien Giang. 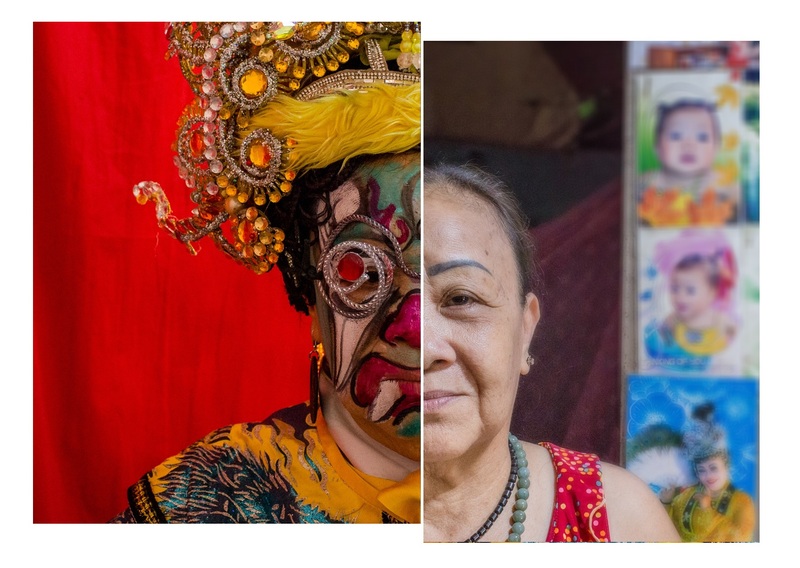 The walls surrounding her are replete with hundreds of photos of herself in flamboyant costumes, posing as ancient queens and princesses, and in some of them, as Guanyin, the Goddess of Mercy in Buddhism. “On stage I play the queen ruling the people; at home I hand-embroider clothes to make a living,” Hanh said, half joking at the irony, her eyes fixed on a green silk cloth stretched in front of her. 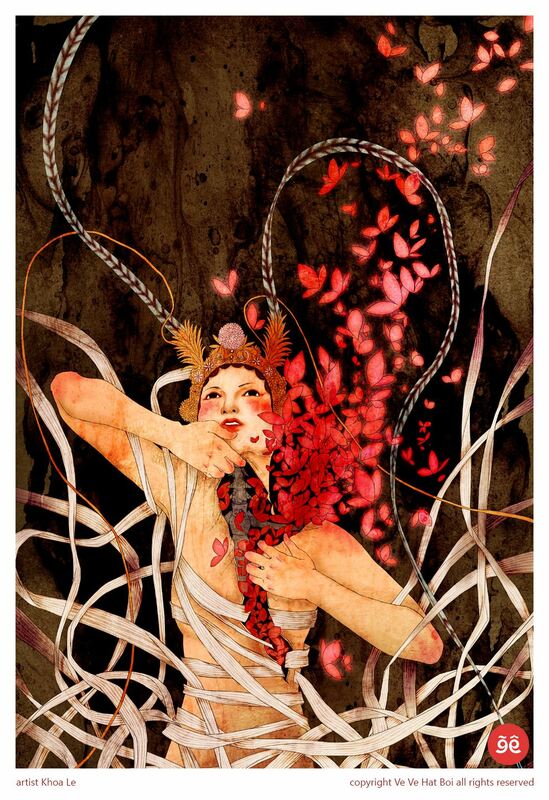 A phoenix patch starts to form with sequins and beads as her hands go up and down with a needle. 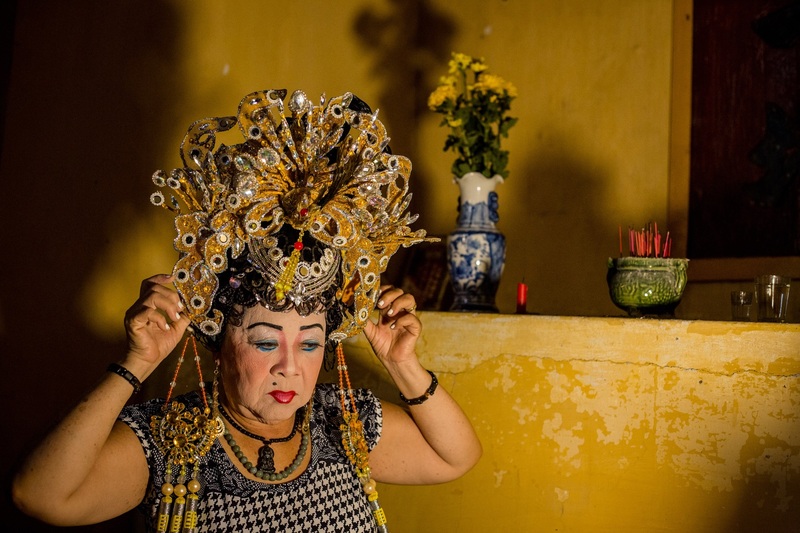 At 67, Ngoc Hanh (her stage name) is the senior actress of the Ngoc Khanh troupe, one of the best known hat boi troupes in the south of Vietnam. 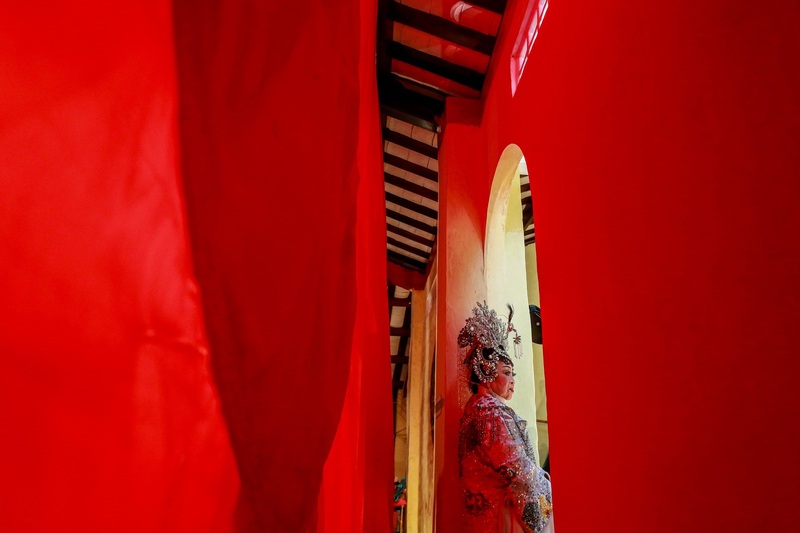 After decades on stage, the part-time artist now sees herself among the few people left who are still trying to keep this classical Vietnamese opera form from vanishing forever. Nguyen Thi Hanh in her 15 square meter house in Tien Giang Province. The origins of hat boi can be traced back to over 600 years, to a fascinating historical story. 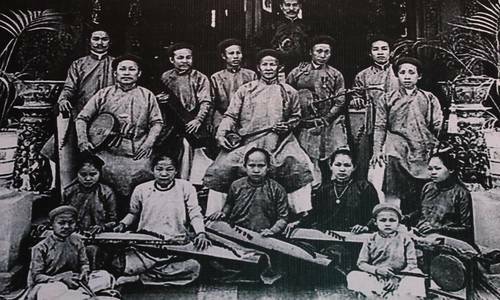 The art form took its roots in Vietnam because of a highly talented Chinese prisoner of war who used his singing and dancing to keep his head on his neck. 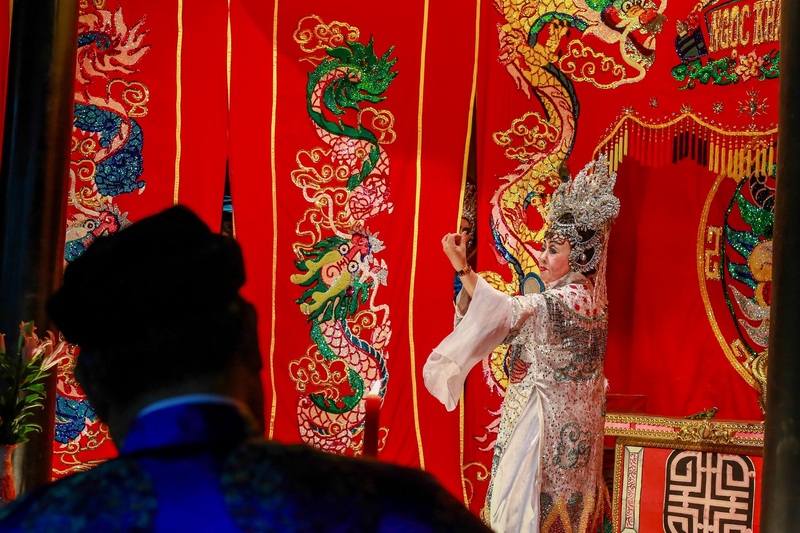 In fact, at first glance, the flamboyant costumes, theatrical scenic backdrops and acting style might lead one to assume that hat boi is the globally distinguished Chinese opera, and one might not be far off the mark. 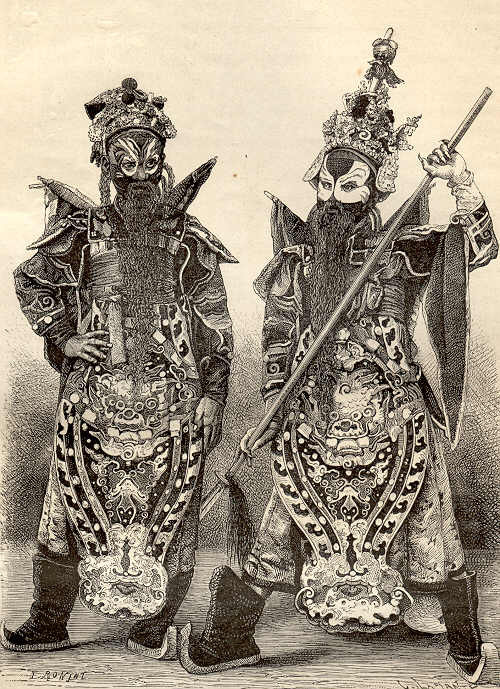 According to Vietnam’s most prominent traditional music scholar Tran Van Khe, in the twelfth century, an actor-turned-solder Li Yuan Ki (or Ly Nguyen Cat in Vietnamese) was pardoned by General Tran Hung Dao (1228–1300) in order that he teaches the Vietnamese “the songs and dances of the Chinese theater. Hat means to sing, and boi is a mask or painted face. 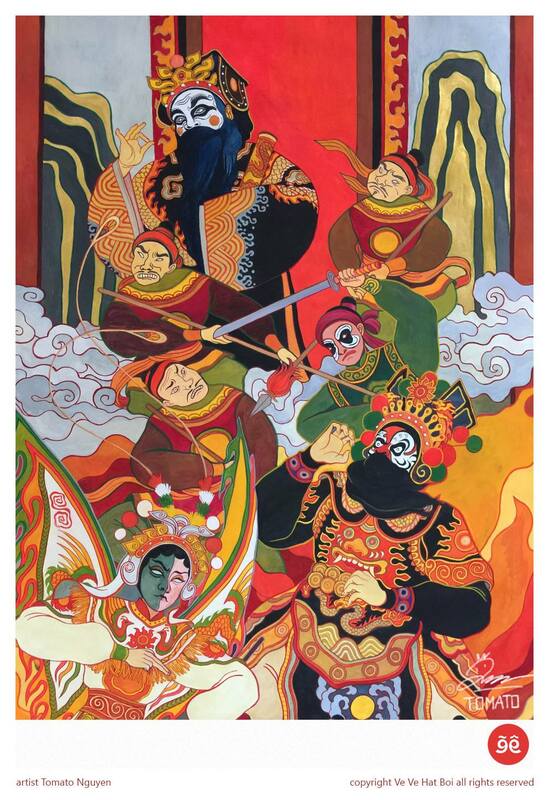 At the beginning, most hat boi scripts were based on Chinese folk stories, but soon the Vietnamese added local adaptations and then began to write their own plays based on Vietnamese folk tales. Another theory explaining the predominance of Chinese plots has to do with the sensitivity of political topics that hat boi plays usually touched on. 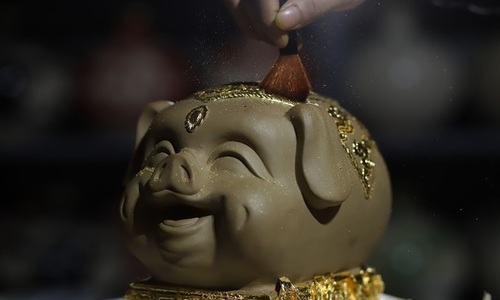 To avoid criticizing the King, the royal court and his rule directly, the script borrowed Chinese characters' names to tell stories related to contemporary Vietnamese issues. Typically, hat boi plays were delivered in Vietnamese and delivered moral and ethical lessons to the audience. 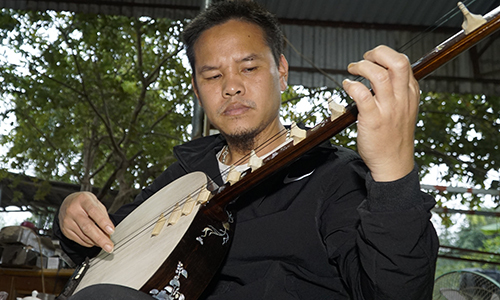 Experts have also pointed out that hat boi, or tuong as it is called in the north, is representative of the country’s history of expansion, including elements of Cham music in the south, adopting certain singing styles, particularly in expressing melancholy and related emotional nuances; and later, using the high-pitch singing voices of the Hua community to express cheerful tones. And despite bearing the visual stamp of Chinese theater, hat boi possesses its own distinctive sounds. Some listeners may find the sound “exceptionally grating,” Miller wrote in his review of a hat boi recording made by Tran Van Khe in 1979. 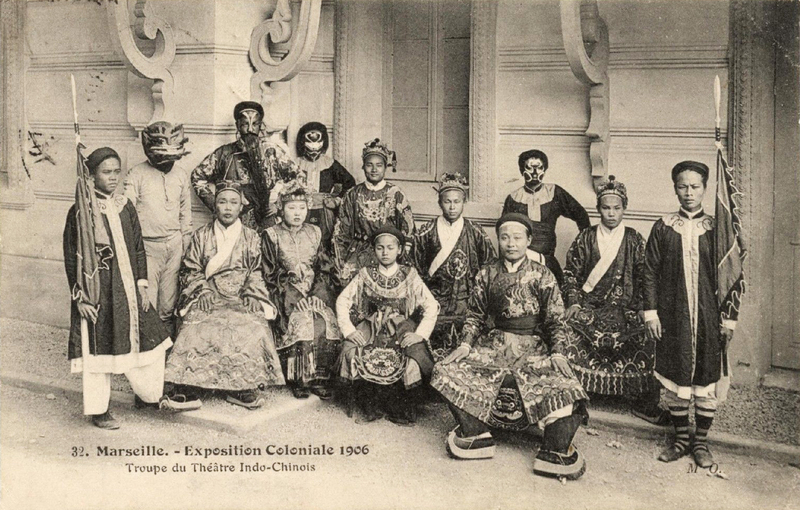 Grating or not, hat boi had charmed generations of Vietnamese upper class citizens at the royal court for centuries, so much so that in its heyday during the reign of the Nguyen dynasty (1802–1945), the emperors not only recruited the best artists in the country for royal troupes, but also joined in composing new plays (Emperor Tu Duc). One (Emperor Thanh Thai) even took a role on stage. From the palace, hat boi percolated down and grew into an art form of the mass as well, especially in the south. It was performed by small troupes for special occasions like local festivals and social ceremonies, at communal temples to markets. 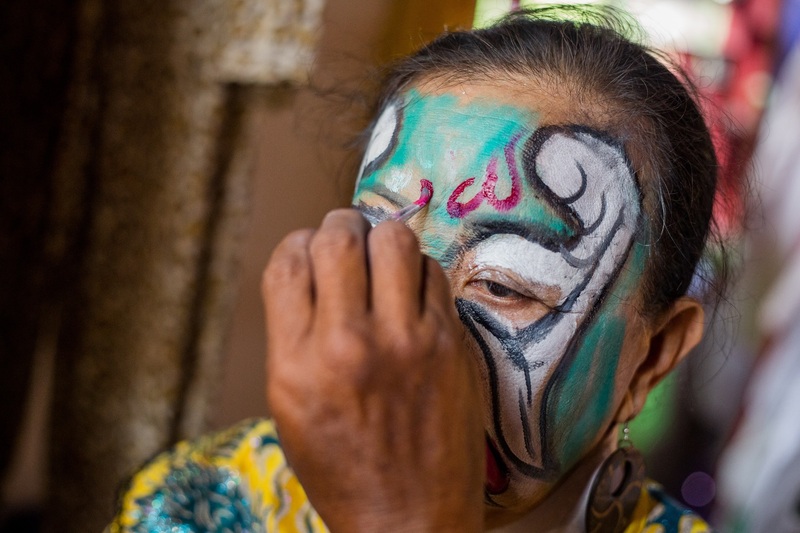 Helping hand: A colleague helps Ngoc Hanh apply makeup backstage at a show in HCMC, 70 km away from her home. Senior classical theater artist Dinh Bang Phi told VnExpress International. It is not a new development that hat boi is not an ideal livelihood for artists. Hanh began the itinerant life of a Vietnamese classical opera singer as a kid. Her parents, father in particular, adored the arts and taught her to sing folksongs when she was just five years old. The Vietnam War, which broke out in the late 1950s and ended in 1975, did not stop the southern classical opera art from blossoming. “Back then I sang mostly cai luong (another popular operatic art form),” Hanh recalled. Hanh herself has acted and sung for over 40 troupes. But these heydays are just a memory now. 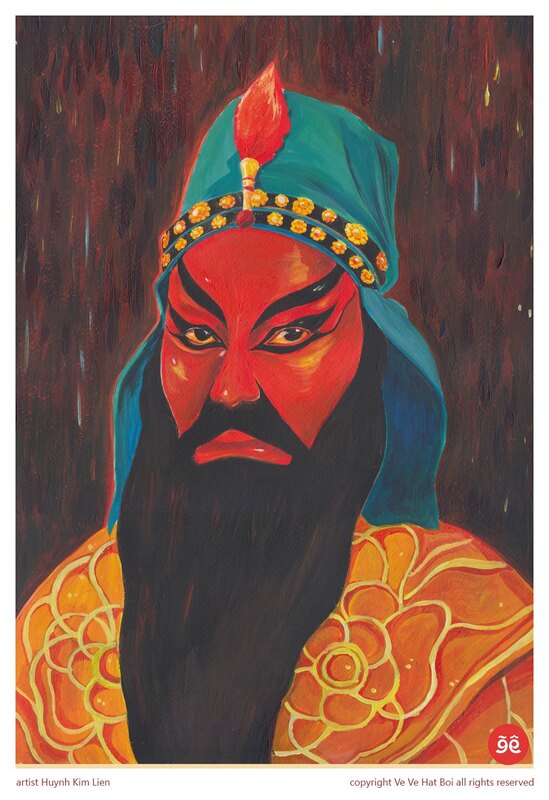 Nothing to smile about: As Hanh waits backstage in costume for the role of Zhong Lichun, a Chinese heroine, nearly half the seats in the auditorium are empty. It was not so bad even in the nineties. By the time she was in her 40s, cai luong was in decline, and hat boi reached its peak, dominating stages in the south. Its rise amidst the era’s economic hardship is attributed to the custom of villages’ communal temples inviting/hiring hat boi troupes to perform rites at their ceremonies, praying for peace and prosperity, for the people and the nation. The group then stayed on performing entertainment numbers for the local audience until late for several following days. With the help of masters in her circle, Hanh turned to tread the boards as a hat boi actress after a year of training and practicing. She nailed big roles like queens, goddesses, and historical heroines. 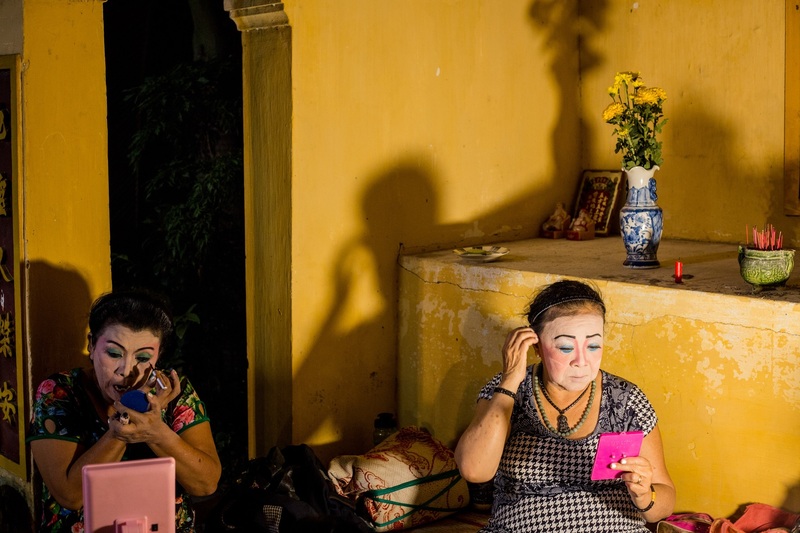 Despite the art form’s popularity, life behind the closed curtains of Vietnamese opera actors was as far removed from the fancy on the stage. Dramatic moment: Ngoc Hanh onstage. But the late nineties saw televisions and CD players swoop into the market, drawing audiences away from traditional performing arts. These days, she and her colleagues have to take extra jobs to afford life on stage, with each performance earning them a meager VND300,000 ($13) each. The doyen of hat boi believes that the high pitched singing and the low income it offers make the art unappealing for new artists to come in. 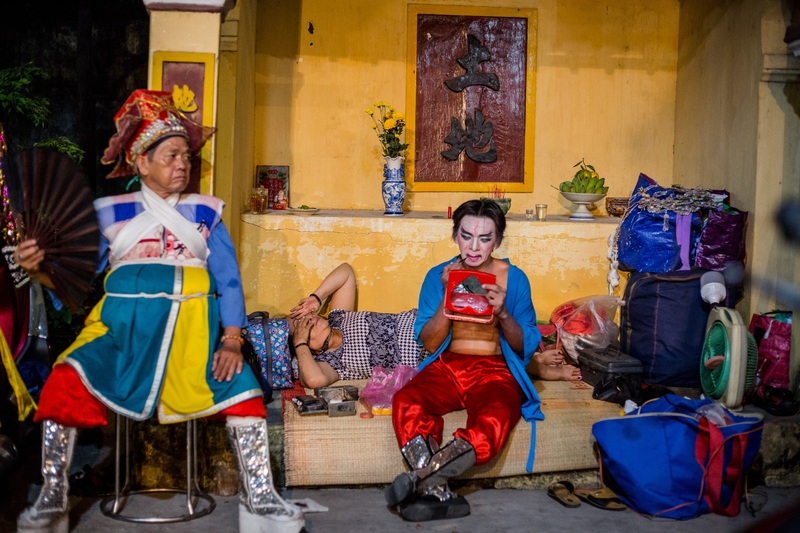 "Most of the hat boi younger generation are children of the senior artists,” Nguyen Hoan, director of HCMC Theater of Hat Boi Art told VnExpress International on a recent morning. 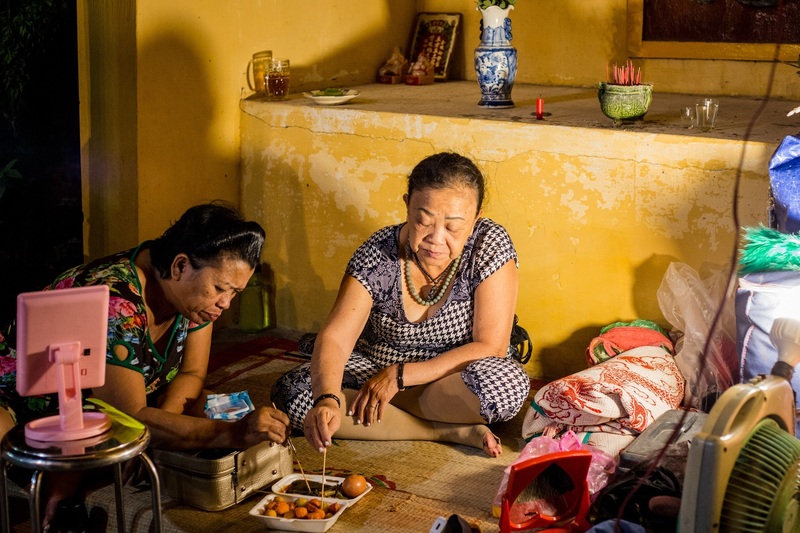 Among 50 members, the theater has only five who are in their 20s, and they have start with VND3 million a month at best. "This salary is hard to live on. Over time most of them just drop the art to find new jobs," said Hoan, sighing. Keeping it in the family: Ngoc Hanh (left) and her son Nguyen Huu Hoang, 44, perform together for the Ngoc Khanh troupe. They travel to every show on an old motorbike stacked with performance equipment. "We are stopped sometimes by the traffic police, and even get fined for overloading," said Hanh, giggling. The 41-year-old theater itself, the biggest in the south, now survives on 140 shows a year, all free. The theater runs on the government budget, and sells no ticket. 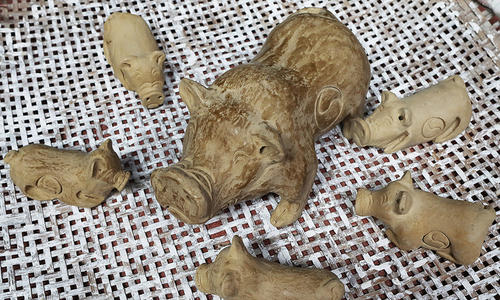 Despite the bleak outlook, however, private troupes like Ngoc Khanh and government-funded Theater of Hat Boi Art are still committed to preserving one of the oldest art forms in the country. "We try to perform anywhere we can," Hoan said, "outside the rundown stage in this theater. We play at festivals and community ceremonies, and in public spaces like the Pedestrian Street in Nguyen Hue whenever we are allowed." 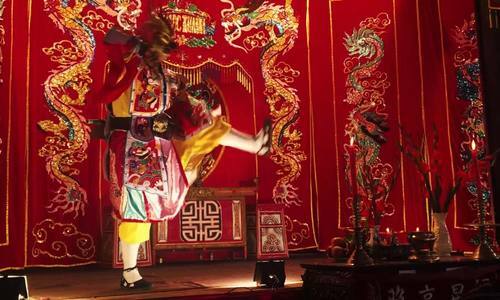 But he conceded that it is tough for traditional art performance to compete with the screens, referring to TV, mobile devices and laptops with internet access. (L) A visitor at the Ve Ve Hat Boi, or "Sketching Hat Boi" exhibition held in February 2018. (R) A young audience enjoys an outdoor hat boi play. The performance was part of the exhibition. Some light appeared at the end of the tunnel earlier this year, when a series of events were orchestrated to promote hat boi among the youth. Among these was the well-received Ve Ve Hat Boi ("Sketching Hat Boi") exhibition where nearly 100 young Vietnamese from different fields teamed up with senior artists Dinh Bang Phi and Huu Danh to reproduce and recreate the traditional opera with a contemporary touch. As the creative project caused a sensation on social media long after the exhibition ended, Ve Ve Hat Boi's Facebook page now helps its 11,300 followers to keep up with upcoming performances in Ho Chi Minh City. "Thanks to their efforts, hat boi shows have started to see new faces in the crowd," Hoan said, referring to the young group behind the project. The theater's artists have just been invited to perform hat boi for several TV stations, something that had not happened in the past four years. Hoan was cautiously hopeful: "We are trying to keep up with the new attention."